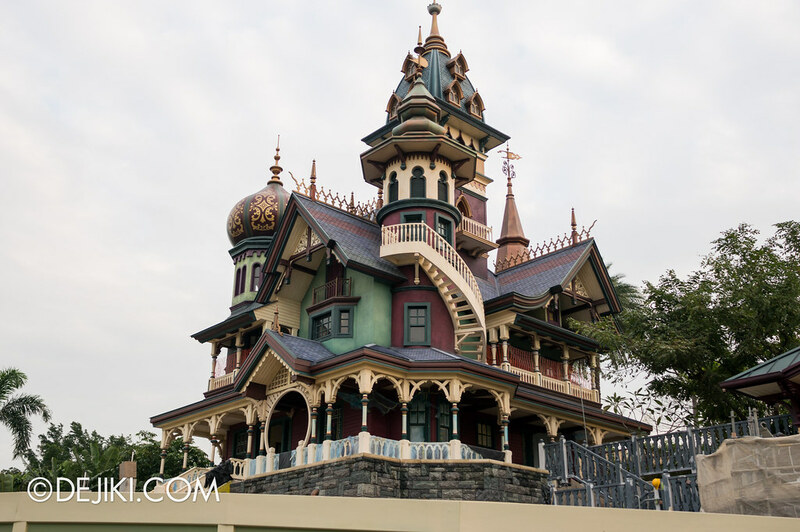 Mystic Point is one of the new themed areas at Hong Kong Disneyland. 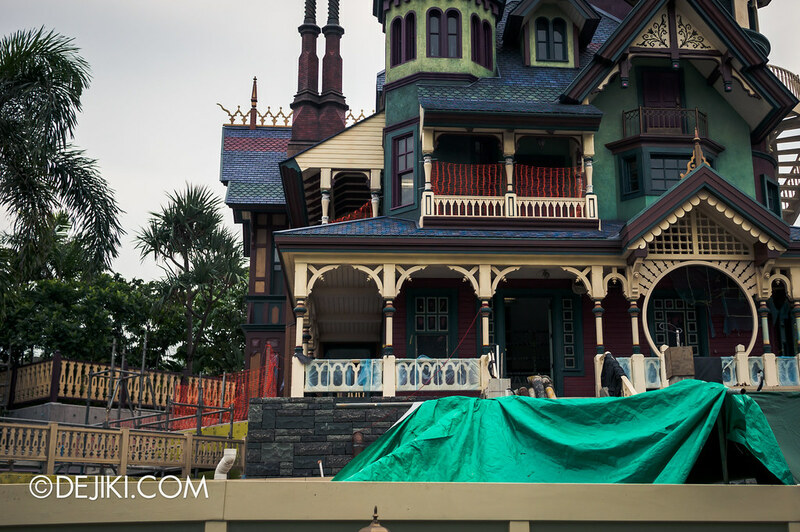 Slated to open in Mid 2013, the themed zone features key attraction Mystic Manor and a play area called Garden of Wonders. 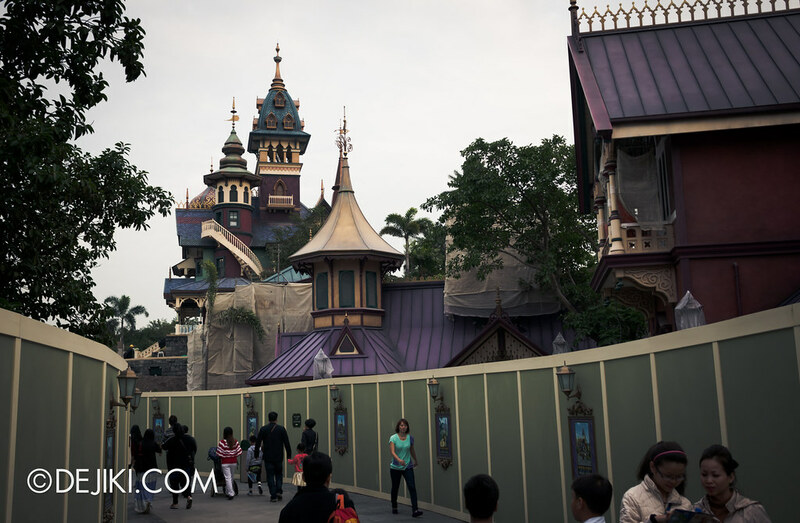 I’m very excited about Mystic Manor and had a chance to see the area under construction when I was at Hong Kong Disneyland recently. While I cannot comment (critically) about its architecture, I’m amazed at how it looks in reality. There is a lot of detail everywhere and the colour scheme reflects the area’s adventure, mystery and occult character well. 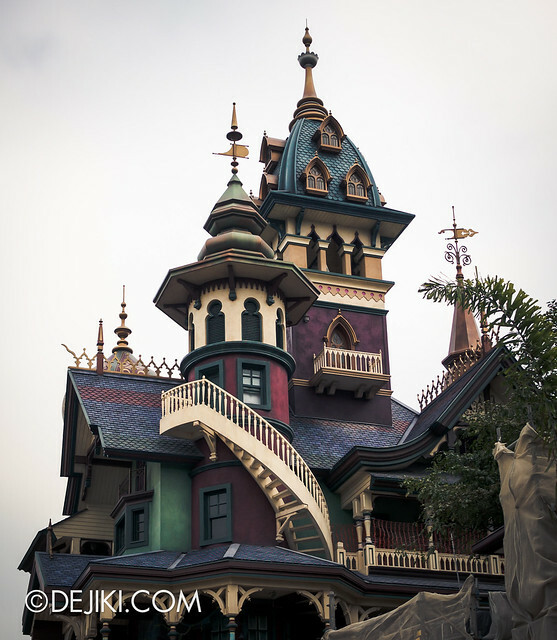 Enjoy the photographs and read about Mystic Manor as you go along. ※ Some photographs have been edited for dramatic presentation. 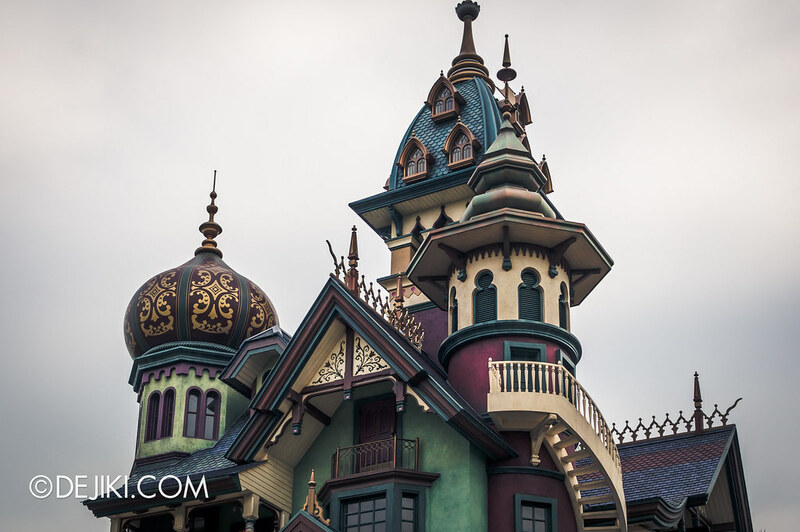 Mystic Manor is Hong Kong Disneyland’s answer to the classic Haunted Mansion attraction found in other Magic Kingdom Disney Parks worldwide. Three of these, called Haunted Mansion, can be found at Disneyland (Anaheim), Magic Kingdom (Walt Disney World) and Tokyo Disneyland. 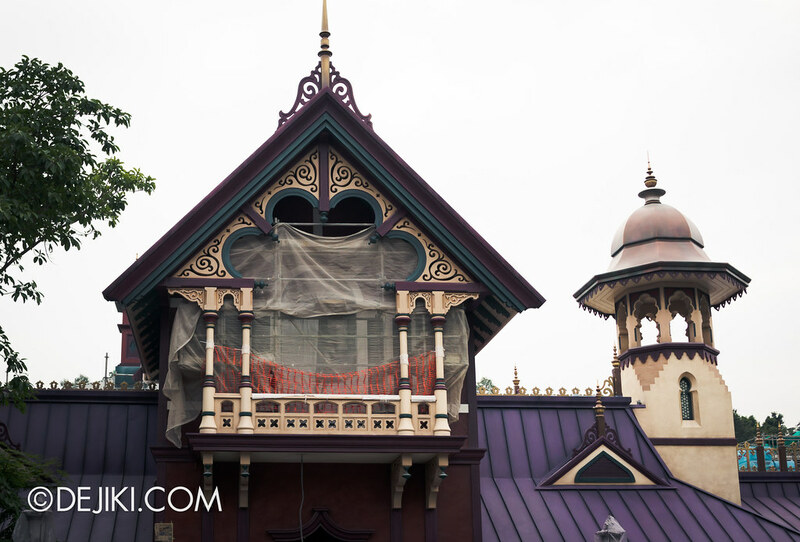 With a new story, design and location, the Haunted Mansion was re-imagined as the Phantom Manor at Disneyland Paris. Fun Fact: Each of these attractions are housed in a different themed area in each park (In the order of park names mentioned above: New Orleans Square, Liberty Square, Fantasyland and Frontierland), giving the mansion a unique home all around the world. 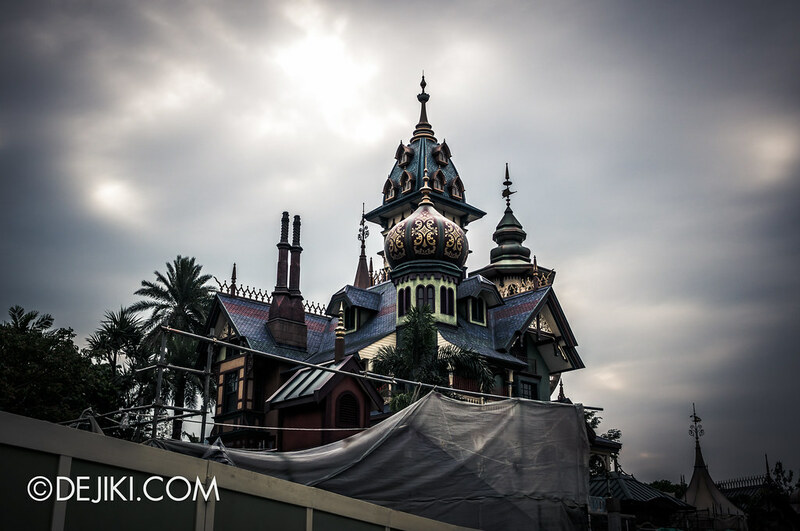 Before Hong Kong Disneyland opened, there were several rumours circulating about its Haunted Mansion. The park didn’t open with one. Well, neither did the first Disneyland. Several rumours went around, including one popular idea: A Mansion at Adventureland, with the safari and voodoo as its themes. That didn’t happen, but years later something even more exciting was announced – The park will expand with three new themed zones, one of which is called Mystic Point, and it will have a new, unique attraction that is both spooky, mysterious, and comedic. 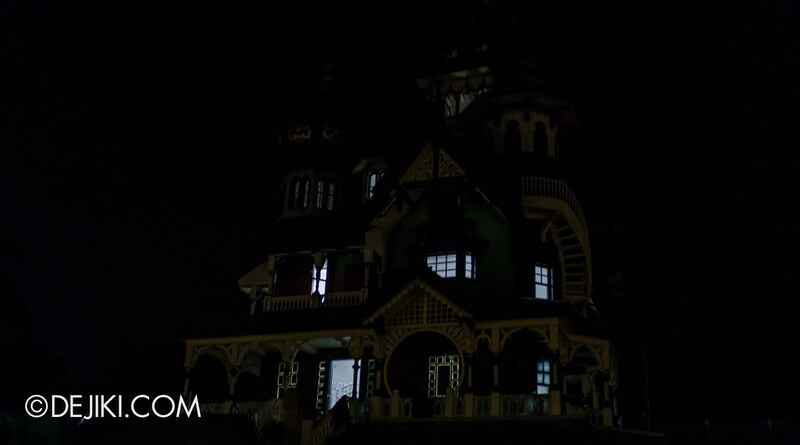 Mystic Point is set in 1908, and is a site where supernatural events and mysteries. 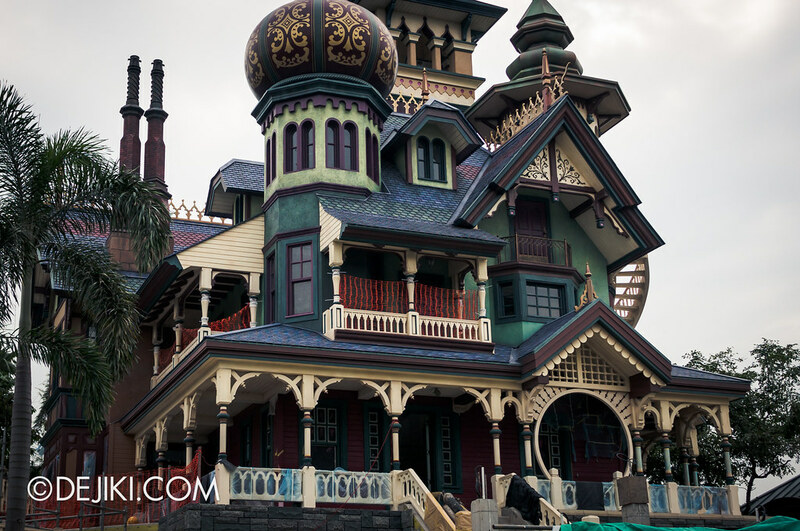 In its heart is Mystic Manor, home to Lord Henry Mystic. He is a member of the Society of Explorers and Adventurers (Sound familiar? This is carried over from Tokyo DisneySea.) and in his home is an extensive collection of artifacts from around the world. Also in Mystic Point: the Adventurer’s Club is a themed restaurant located near the Manor. There is also a themed retail store, called Archive Shop which should sit between the Manor and Restaurant. 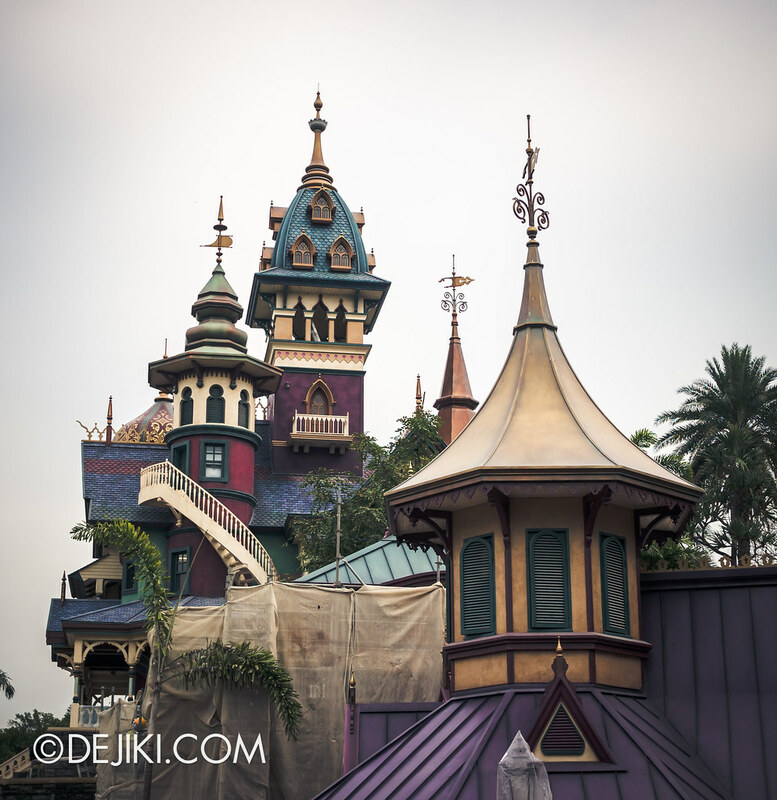 The experience of Mystic Manor is a tour around the manor, where guests are seated in trackless ride vehicles. The ride technology is said to be very similar to the one used at Pooh’s Hunny Hunt at Tokyo Disneyland. The story revealed so far speaks of a whirlwind adventure (literally – in one of the scenes apparently) where Lord Mystic’s pet monkey, Albert, opens an enchanted box which causes ALL the artifacts to come alive, Night at the Museum style. 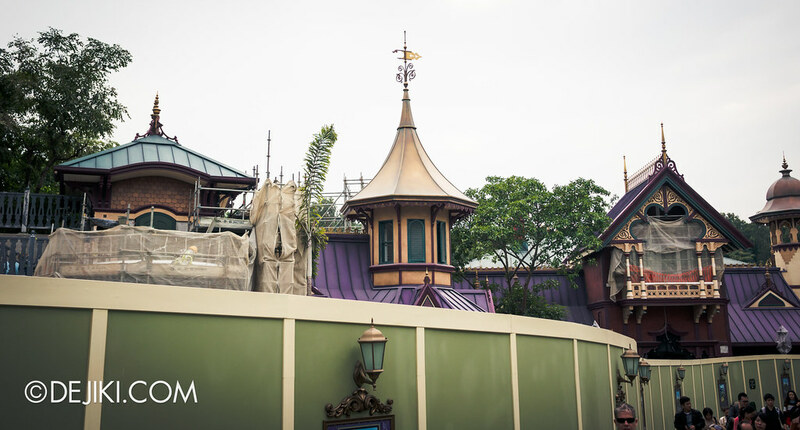 Here are photos of the Archive Shop and Adventurer’s Club buildings. 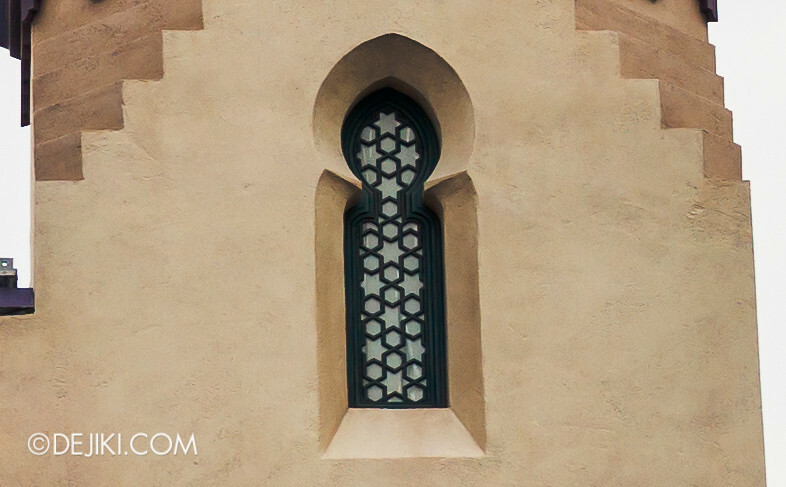 This tower reminds me of some mosque towers, especially with the geometric window grille design. Overview of the area, viewed from Toy Story Land. On the left is the Garden of Wonders. This is both a play zone and a rest/viewing venue, where the Hong Kong Disneyland Railroad and part of Jungle River Cruise‘s River of Adventure may be seen. The Manor at night. Nothing much to see because the show lighting isn’t on, but from the lit windows, we can tell which levels are “real” and will possibly have some effects installed. 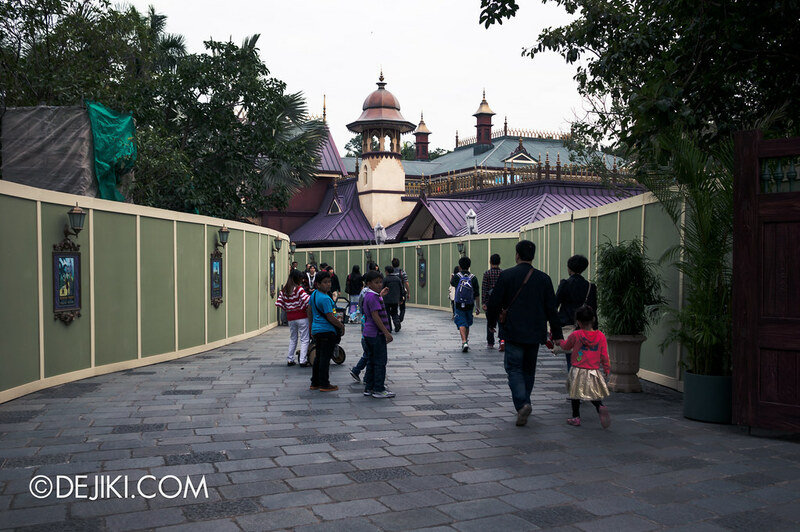 Stay tuned for more updates and photos from Hong Kong Disneyland! I’m excited to present extensive photo tours of all the themed areas in the park, including the new Grizzly Gulch and Toy Story Land. Guess what! I have just come back from Hong Kong as well! I have been very impressed by the new lands, especially Grizzly Gulch and Mystic Point. 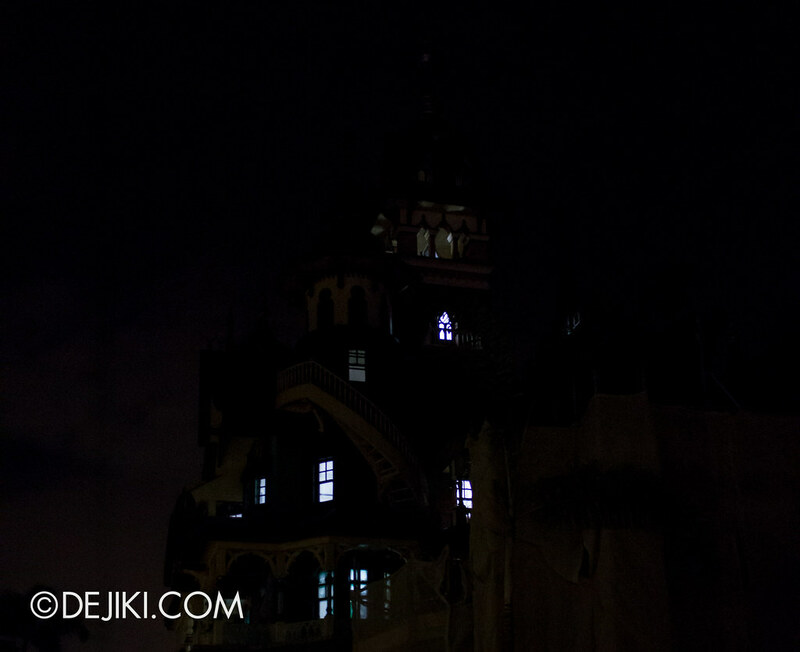 Mystic Point features the kind of ride that I love most, a dark ride with a supernatural theme. I am excited to see how the pet monkey will be ingetrated into the adventure, since in other mansions you are not with one. And I also want to see the cannibalplant I saw in one of the artworks. I have seen several promo videos about the ride and I think it will be fascinating. But I have some concern about the new lands. The three new lands are smaller compared to the original four, and this kind of divides the park, making the theme less consistent. I prefer they expend the existing lands and integrate the new attractions in them. Devoting resources on creating smaller, but more unique themed areas may be a better long-term strategy for this park, especially with SHDL in the pipeline. People who are not theme park fans are likely perceive the addition of these smaller unique areas as more significant than adding an attraction to an existing themed land. The concept for the three “mini-lands” reminds me of the design for USS, where each (small) themed zone has a key attraction and something minor to offer. After riding Big Grizzly Mountain, there “seems” be nothing else of interest in the area, except this is a Disney park – being in a themed area is a major part of the experience. I understand your concern of the park being thematically less consistent, but Disney has built several of these “mini-lands” before – just that for the first time, three of them are side by side. While the lands may seem small, they are very immersive and thematically strong on their own (with incredible theming and engaging stories). There is a sufficient transition area between each land, which is something I wished USS had. 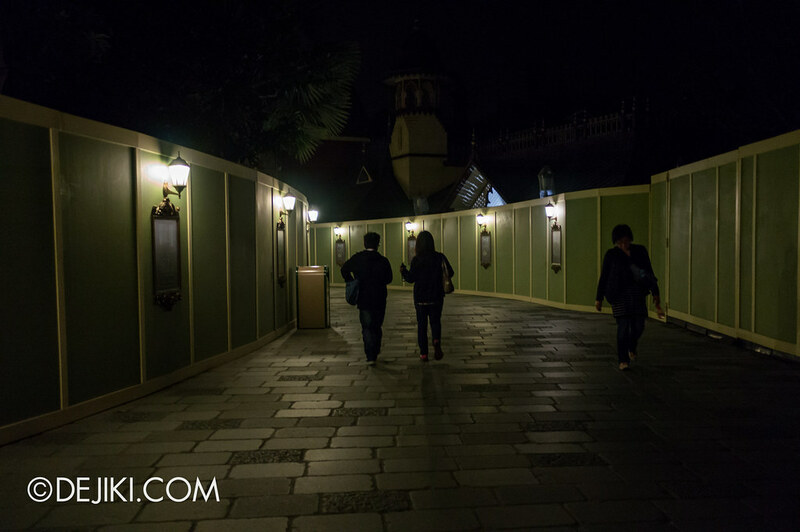 I’m also glad that Mystic Point and Grizzly Gulch are confirmed to be exclusive to HKDL. With more theme parks being built around the world, it’s important to keep each park unique – it’s an organic way of enhancing guest experiences, after all, people travel not to see the same things they already could (unfortunately, we’re seeing less of this for Universal Parks). My hope is that the park would expand further, but from the way things look, only Grizzly Gulch and Toy Story Land could expand. Perhaps there would be an actual Frontierland, and Toy Story Land could get “Toy Story Mania”. This would make HKDL the only park in the world to have both Toy Story dark rides! 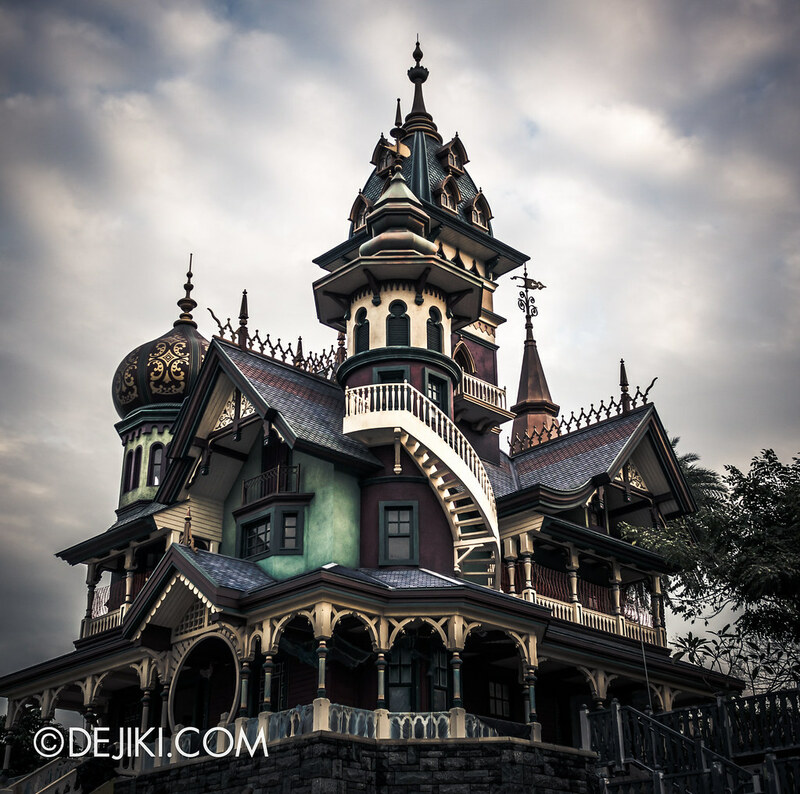 Anyway, I hope that a Haunted Mansion will be built (eventually) at Shanghai Disneyland. Well I agree that the three mini lands are very well themed and they are more appealing to the guests than three new attractions. For the future expension, I would hope they replace Autopia with new attractions at the Tomorrowland side. They do have a lot of space at the left and right corner of the park. But the issue is that HK government actually is the biggest share holder of the park, so whatever desicions made will be approved by them. This will result in some disagreements. 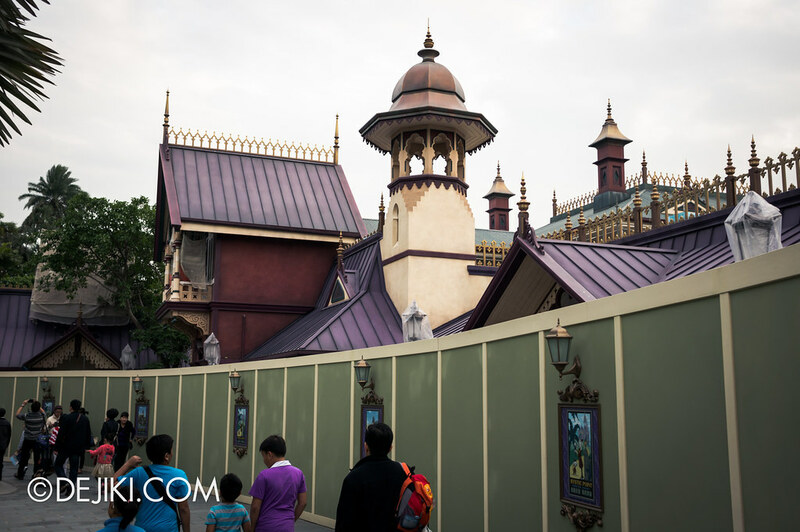 And yes I hope Shanghai will have a Haunted Mansion of its own! (And a Big Thounder Mountian of its own as well 🙂 ). I also agree that Autopia could be taken away for something else. It’s a space hog and has low guest capacity, though it is very popular. Maybe Star Tours could go there (it was planned for 2014 and cancelled, apparently). I also hope that they expand the northen part of Fantasyland some day (remove the “Fantasy Gardens” please!) for a unique dark ride. I don’t think they will build elements of Magic Kingdom’s New Fantasyland or Seven Dwarfs coaster here, there’ll be too many duplicates! Then again, SHDL is getting Toy Story Land too. I believe that once SHDL opens, the HK Government will be more open to ideas to stay competitive. They are in discussions on further expansion after Mystic Point, though it seems to focus more on expanding the resort as a whole; not just adding new attractions in the park. I will probably go there next January. Im a big fan of Disney and have been to all it’s world wide theme parks many times. I have a friend that works in admin in HKDL and he has told me there are plans to expand Grizzly Gulch it will most likely have the a better themed & story version Big Grizzly Rapids from DCA. They also talked about placing Splash Mountain there but at the moment it seems to expensive another option was a completely different flume ride. Dejiki you mentioned if HKDL get Toy Story Mania it would make it the only toy story land to have both dark rides what is the first dark ride or did I miss it on my last visit? Splash Mountain would be a nice addition, but it doesn’t feel right with the narrative of Grizzly Gulch. Perhaps a new flume ride would be a better idea. Great pictures! I really love the color scheme. Is it true that this is going to utilize a “trackless” ride system? I have read a few excellent stuff here. Certainly worth bookmarking for revisiting. I surprise how much attempt you place to make this sort of great informative site.